With a selection of colored felt and some imagination, you can create a brightly colored parrot costume that can be used again and again. 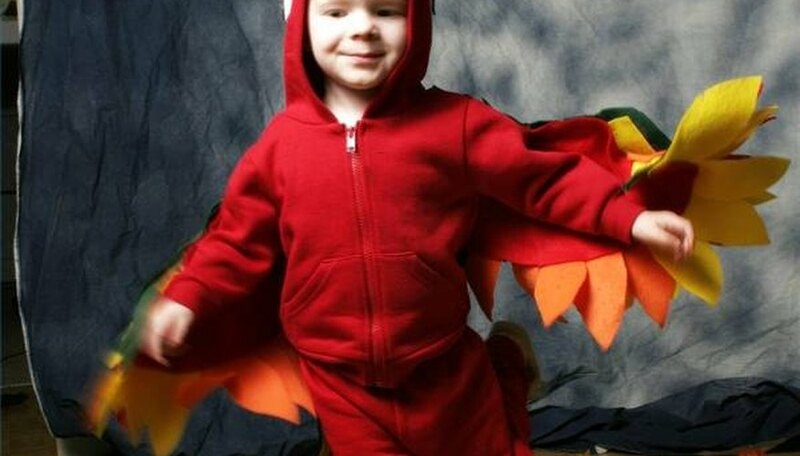 Parrot costumes can be worn by kids and adults on Halloween, for costume parties and at events with a pirate or jungle theme. 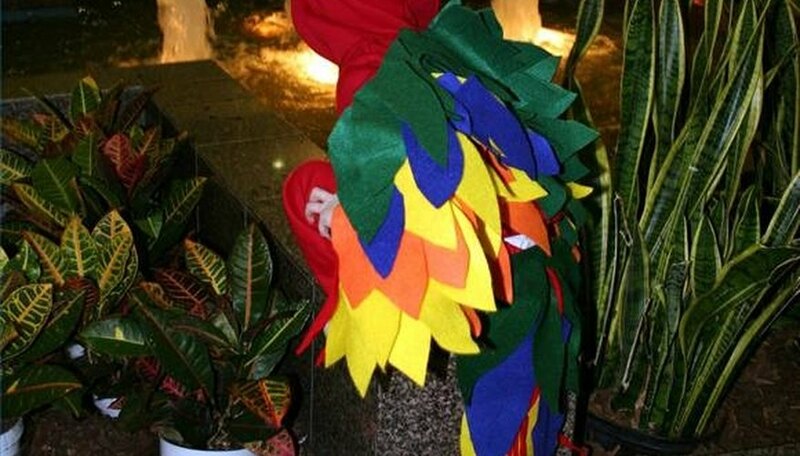 Construct your parrot costume with red, blue, yellow, green and orange felt to create a design that will display a flurry of multicolored feathers. Measure the hooded sweatshirt straight down from the top center edge of the shoulder seam to the front center bottom edge of the sweatshirt sleeve. Using that measurement, create a pattern by marking a sheet of newspaper the same length and drawing an oval shape one-and-a-half-feet wide by the length of the sleeve measurement. Cut five pattern pieces from the newspaper. Set one pattern aside. Cut the four remaining patterns in graduated lengths to create wing layers as follows: Cut two inches off the length of the second pattern; four inches off the length of the third pattern; six inches off the length of the fourth pattern; and eight inches off the length of the fifth pattern. Pin each wing pattern to your selection of one-yard felt colors. Using the pattern as a guide, cut the felt. You will need to cut two of each size to create a pair of wings. Do not discard the patterns. Place the longest wing layer on the sweatshirt sleeve, starting at the top center edge of the shoulder seam. Pin the top center edge of the wing layer to the top center edge of the shoulder seam. Pin the length of the wing layer to the length of the sleeve, aligning the center of the wing layer to the top center of the sleeve. Stitch the wing layer to the sleeve along the center of the wing layer and the center of the sleeve. Place the wing layer that is two inches shorter on top of the longest wing layer. Center the top straight edge of the wing layer to the top center edge of the shoulder seam. Pin the top wing layer to the bottom wing layer. Stitch the top wing layer to the bottom wing layer along the center of the felt layers. Stitch two-thirds of the way down the length of the top layer. Place the wing layer that is four inches shorter on top of the previous wing layer. Center the top straight edge of the wing layer to the top center edge of the shoulder seam. Pin the top wing layer to the wing layer underneath it. Stitch the top wing layer to the wing layer underneath it, along the center of the felt layers. Stitch half of the way down the length of the top layer. Place the wing layer that is six inches shorter on top of the previous wing layer. Center the top straight edge of the wing layer to the top center edge of the shoulder seam. Pin the wing layer to the wing layer underneath it. Stitch the top wing layer to the wing layer underneath it, along the center of the felt layers. Stitch one-third of the way down the length of the top layer. Place the wing layer that is eight inches shorter on top of the previous wing layer. Center the top straight edge of the wing layer to the top center edge of the shoulder seam. Place the straight edge of the wing layer along the shoulder seam. Pin the wing layer along the shoulder seam. Stitch two inches on each side of the center of the wing layer along the shoulder seam of the sleeve. Create a tail using your five wing patterns. Place each wing pattern on your selection of felt colors, one pattern per color. Pin the pattern to the felt. Cut out the felt along the edges of the pattern. Cut one of each size. Place the top of the longest tail layer two inches up from the center bottom edge of the back of the hooded sweatshirt. Pin into place. Stitch across the width of the tail layer, one inch up from the bottom edge of the hooded sweatshirt. Center the tail layer that is two inches shorter on top of the longest tail layer. Pin the top tail layer to the tail layer underneath it. Stitch the straight edge of the tail layer, one inch up from the bottom edge of the hooded sweatshirt. Center the tail layer that is four inches shorter on top of the previous tail layer. Pin the top tail layer to the tail layer underneath it. Stitch two inches across the center of the straight edge of the tail layer, stitching it to the tail layer underneath it. Place your stitches one inch up from the bottom edge of the hooded sweatshirt. Center the tail layer that is six inches shorter on top of the previous tail layer. Pin the top tail layer to the tail layer underneath it. Stitch two inches across the center of the straight edge of the tail layer, stitching it to the tail layer underneath it. Place your stitches one inch up from the bottom edge of the hooded sweatshirt. Center the tail layer that is eight inches shorter on top of the previous tail layer. Pin the top tail layer to the tail layer underneath it. Stitch two inches across the center of the straight edge of the tail layer, stitching it to the tail layer beneath it. Place your stitches one inch up from the bottom edge of the hooded sweatshirt. Draw a six inch oval shape on a piece of newspaper to create the white portion of the parrot eye. Cut out the pattern. Place the pattern on the white felt. Pin the pattern to the felt. Cut out the felt along the edges of the pattern. Repeat. Place one white felt piece on each side of the hood. Pin into place. Stitch the felt to the hood. Draw a one-and-a-half-inch circle on a piece of newspaper to create the pupil of the parrot eye. Cut out the pattern. Place the pattern on the black felt. Pin the pattern to the felt. Cut out the felt along the edges of the pattern. Repeat. Place a black pupil on the lower half of each white piece of felt. Pin into place. Stitch the black felt to the white felt. Draw a triangle eight inches long and four inches wide on a sheet of newspaper. Cut out the pattern. Place the pattern on the black felt. Pin the pattern to the felt. Cut out the felt along the edges of the pattern. Place the top center edge of the felt beak five inches in from the top center edge of the hood, with the pointed edge of the triangle facing out and over the front edge of the hood. Pin the beak to the top of the hood. Stitch the beak into place. Put on the hooded sweatshirt. Put on the matching sweatpants. Adjust the hood so the beak is slightly over the front of the hood. Sew felt using small stitches. To curve the parrot beak, cut the beak base and sides into a gentle curve. When you attach the beak to the hood, the cut curves will create a slight slope to the beak. Be careful when trying on the hooded sweatshirt with pins in it. Safety pins are a good option, especially when sewing the costume for a child. Pins with brightly colored heads are easier to see.